Grindelia squarrosa (Pursh) Dunal var. serrulata (Rydb.) Steyerm. Habit: Biennial 1--6 dm, decumbent to erect, much-branched throughout. Leaf: 1.5--7 cm; basal leaves generally 0 at flower, distal not much smaller; blade oblong to ovate, sessile or narrowed at base, glabrous, resinous, gray-green, crenate, each tooth with a +- yellow bump near tip. Inflorescence: involucre 10--17 mm diam, bell-shaped, glabrous, resinous; phyllaries in 5--6 series, bases wide, straw-colored, tips green, acuminate, +- round in ×-section, coiled 360°. Ray Flower: 0 or 24--36; ray 8--10 mm. Fruit: 2.3--3 mm, light brown to +- yellow, top truncate; pappus awns 2--3(6). Chromosomes: 2n=12. Ecology: Disturbed roadsides, streamsides; Elevation: 700--2300 m. Bioregional Distribution: CaRH, SNH, TR, GB, DMoj; Distribution Outside California: native Wyoming to New Mexico. Flowering Time: Jul--Sep Note: TOXIC, concentrates selenium. 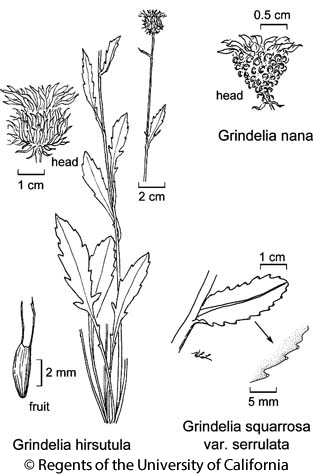 Citation for this treatment: Abigail J. Moore 2012, Grindelia squarrosa var. serrulata, in Jepson Flora Project (eds.) Jepson eFlora, http://ucjeps.berkeley.edu/eflora/eflora_display.php?tid=7515, accessed on April 23, 2019. CaRH, SNH, TR, GB, DMoj; Markers link to CCH specimen records. Yellow markers indicate records that may provide evidence for eFlora range revision or may have georeferencing or identification issues. Purple markers indicate specimens collected from a garden, greenhouse, or other non-wild location.